The American Garage rings in 2019 with some new shows! Steve has been working on some new projects, and doing some how to's on cars repairs. Currently, there are two videos on maintaining an Audi A8, with the featured repair being the replacement of the timing belt. This is a common item on most Audis, as Steve has done the A6 at an earlier time. There are a lot of similarities, but each car being unique, this will be a good guide to someone working on this car. The first video is how to prepare the A8 for service. This involves all the steps to tear the front of the car down, so that it can be worked on. You can find it here. The second video replaces the timing belt, water pump and thermostat, and can be found here. All car repair videos are kept on the Car Repairs page, so check it out! We are gearing up for new projects this fall. What kinds of projects interest you? Give us a comment and let us know. As most of you know, Hurricane Harvey blew through Texas, and Houston got its fair share in the form of a year's worth of rain in just 4 days. We are using our skills and abilities to help family, friends and neighbors recover from this event. Here at TAG, we will also be doing our part to blow out the internet lines with some new shows, new projects, and a revisit of some old ones too. Stay tuned as we get things up and going again! As you have no doubt just enjoyed the first episode of TAG, I thought I would give you a little more info about the project we have acquired. There are a few little details that we did not make evident in the show. First of all, here is a picture of our project when we purchased it. As you can see, it is not just one David Bradley, but two. They came with old Briggs & Stratton engines, and was received in a basket case condition. What is a basket case? Go take something apart, throw all the parts in a big basket, and all the nuts an bolts in a box, give them a big shake, hand to someone else and voila! Here is a funny side note about the purchase. I called the guy and asked him how much to purchase the DB’s. He said $150. I said ok. He said, “Well now you don’t have to be so hard nosed about it. Ok, $125.” I said ok. He said,” You really drive a hard bargain! Okay, $100, and that is my final offer!” I said ok, but you better stop before I get it for free. Ha! I never knew I had such fantastic negotiating skills. I did try to work this little story into the script but it just didn’t work. So, here it is. Now, we will get into detail on the different aspects of the restoration, so if you have any questions, drop me a note and I will answer your questions on the website as best I can. 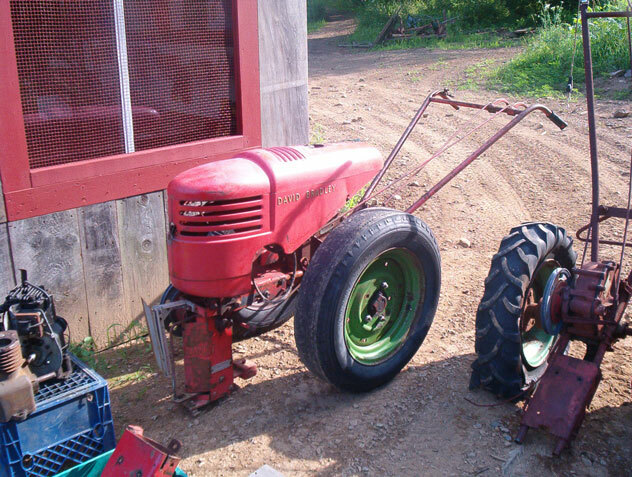 In episode 2 we start the tear-down process on the David Bradley Garden Tractor project. In Episode 3, we will remove rust from all the pieces, now that we are organized and disassembled. Follow along as we cover some different techniques for handling rust. Oh my goodness the year has start off with a bang! Today I thought I would let you in on happenings in the Garage, and status of the project and related items. Where to begin?! I guess we will start with the project. The tractor is coming along, and we are getting close to painting. Some of the challenges that came along that slowed things down a little are 1. Christmas, 2. work the company had to do, 3. other projects that had to be done, and 4. searching for head gaskets for the engines and seals for the transmission. So I located a company that can make new head gaskets for me from scratch, since our old Briggs & Stratton engines are hard to find parts for. Yes, we have 2 of them, although with the magic of movies you only see one. We have 2 whole DB tractors. The second one has considerable problems, but we are pushing forward. The transmission seals on the axles were bad, which means that oil leaks out of there and makes the tractor a oily dirty mess. I want to replace them before we paint, so we don’t mess up the paint job. Always try- if you can- to do all the repairs after you have cleaned everything, but before you paint. I put the primer on so I don’t have a rust problem while I am making the repairs. Episode 4 is almost finished, and after I finish this blog, I am on it, so be watching out! I will get it o you ASAP. We will be covering metal repair. We used Alumaloy and Castaloy, and we got a lesson from Kino on professional welding. Good stuff! In Episode 4, we tackle how to fix broken metal parts. We use Alumaloy and Castaloy, as well as learn a little about welding using a wire feed welding machine. We went down to the hardware store and rented the unit used in the show.